Again, a huge thank you to @Lilialoman for the setlist reports tonight. When all else failed, she was there for us. Thank you! And thank you to Rafael, Cris, and @devilinfreckles for their reports. From Reeves on Facebook: "my new reeves gabrels 2 signature model (with railhammer pickups and the very comfortable arm contour) is now available from reverend. i have to get one!" From @XYZLIVE: "Almost everything ready to receive you and @thecure at Live Music Rocks!" Another nice one from Ana - Trust. And Just Like Heaven, too. More shirts. Looks like some are R$ 100. Note: Yes, this setlist is correct. The setlist that went out before the show even started, was wrong. It had the main set correct, but listed all encore possibilities. They picked 2 of those sets, they didn't play all 5. Huge thank you to @Lilialoman and Cris for the setlist updates tonight, and to @devilinfreckles for the reports! Note from Michael about the horrible traffic last night (which delayed the show for 30 minutes): "The Ride from Copacabana to the Arena was a disaster. 2.5 hours by taxi. Arrived at the Arena 20 min before the show started." - "I hope we make a new album, but I have no control over that. I would love for the Cure to make another record before we stop"
- Says they might do "Albums of the mid-80s" (mentions 'Kiss Me' & 'Head on the Door') Reflections type shows next year. - Reflections DVD: "We shot it & it was good, but never released, don't know what happened. But also, why release something that brings us back to the first album?" For those of you who want to rent a van to the Bogota show with Bianca (@biva77), please email her at biancavaleria(at)hotmail(dot)com. She needs to know how many of you are going so that she can book the van. The other email you have for her isn't working right now, so please use the one posted here. Thanks! The Cure have landed safely in Brasil! 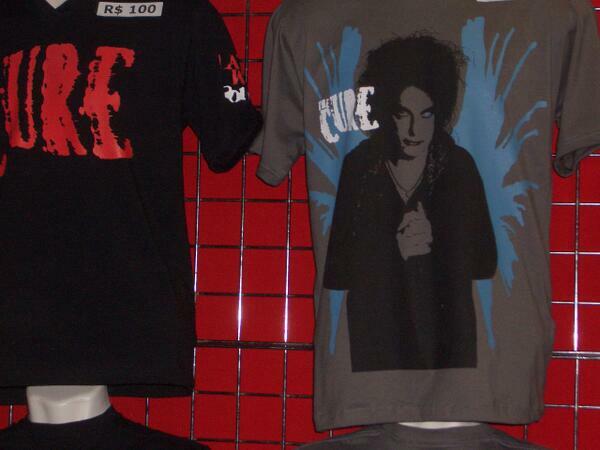 Translation: "The Cure is coming to Chile! The band has just landed in Brazil!" 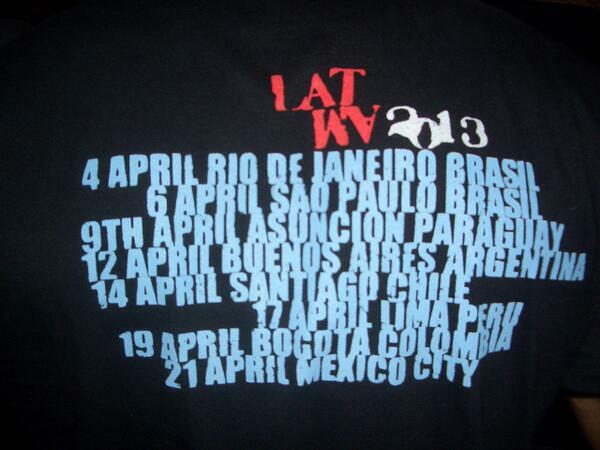 Best of luck, good times, and safe travels to the band, the crew, and Tim Pope on the LatAm 2013 tour! May it be the best ever! Didn't notice this before, but looks like Robert has confirmed that the Osheaga show will be on Aug. 2nd. Notice how 2nd is in bold for Osheaga and 4th is in bold for Lollapalooza? The Cure personally want to book the hotel on arrival in Bogota to preserve their anonymity. The band asks eight dressing rooms. Coffee service constant while in Colombia. Hot water for tea and instant chocolate. A selection of soft drinks (no brand specified). Fresh bread with peanut butter and jelly. 3 bottles of Chianti red Italian wine. 3 bottles of wine Indigenous. 3 bottles of Frascati white wine with ice. 3 bottles of wine Indigenous ice. 3 bottles of champagne with ice (Krug, Mumm, Perrier Jouet, Moet, Laurent Perrier, Lanson or Taittinger). 3 bottles of Moet pink champagne on ice. UOL - You can choose the best album and best song by The Cure? Robert - Wow! Probably "The Greatest Hits" sums it up, but my personal favorite is the album that we're about to launch. I think it's definitely my favorite kind of music. There's a song on the album called "Christmas Without You". It's the best song I've ever written. Of the old songs by The Cure would probably "10:15 [Saturday Night]." I did the Cure because I had this song. "After months of working, finally today we´re relaunching www.thecuremexico.org. We´re very excited for the new tour and with the best hope to share fun and experiences with the fans around Mexico and abroad." Update (04/01/13): 'Faith' takes the top spot! Update (04/02/13): From Lol on Facebook - "I see that the readers of Slicing up eyeballs site have voted "Faith " the best album of 1981! We recorded it when I was the same age as my son is now which is astounding to me to reflect on. It was in many ways a very emotional and intense period of my life. As it was for all of us I think. I feel blessed and amazed that it still resonates with people all these years later. Thank you so much for everything.."
Cure in Buenos Aires broadcast?